Autumn is olive harvesting time! Apart from the core and Organic range that we have George produce for us in Greece, we also buy bulk olives to produce of own signature range of tapenades and pestos that go down so well with our customers. But we are also producing our own Premium jar range at Glenavy that we have devised ourselves – such as Evening Sun, Whole Kalamata Olives with Cardamom and Orange, or Kalamata Devils, pitted Kalamata olives with Sliced Red Pepper, Garlic & Crushed Chillies. 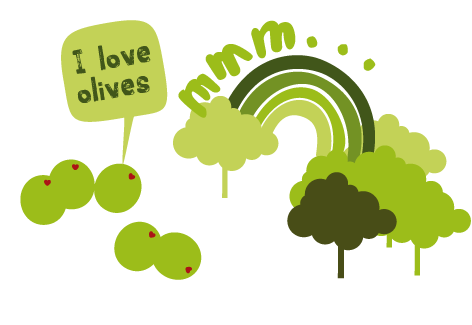 So the whole Love Olive process in infused with love and worthy of our slogan – Produced in Greece, Inspired in Ireland. While our autumn is all about plums, apples, and falling leaves, several thousand miles away at Love Olive’s main olive processor in Greece, autumn is all about starting the olive harvest. People often ask us what’s the difference between green and black olives – the green one is harvested first while the black ones are allowed to ripen naturally on the tree. In the Autumn time the local farmers begin to rake their olive trees to see which of the early green olives are ready to fall. This lessens the impact of any bruising would have on the olives’ flavour and condition and sets Love Olive olives apart from other olive growers. But unlike an Armagh apple that can be eaten when picked fresh from the tree, all olives are actually inedible when picked. The olives, both black and green, need to be stored for a minimum of two months in a solution before being ready to package. So after 15 years of waiting for an olive tree to grow and produce its first harvest, then months of being soaked in solution, you can understand how precious we feel our olives are.